The 2500-40F is a 40-position standard screw-terminal connector for terminating field I/O wiring at the 2500 Series® programmable controller. 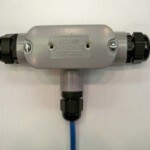 The 2559-FPC is a 36-position screw-terminal connector with built-in cold junction compensation for the 2559-TC Thermocouple Input Module. 2500-RFC CPU to RF Modem Cable. The 2500-TAP Remote I/O Network Tap is specially design for attaching trunkline and dropline sections to create 2500 Series® remote I/O networks. These taps use an impedance-controlled design for highest noise immunity and include built-in termination resistance which can be easily switched in- or out- of the circuit using a toggle switch.